Why Do Parachutes Come in Different Shapes and Sizes? Parachutes, to the untrained eye, are a little mysterious–which breeds curiousity, naturally. How many kinds of parachute are there? How does a skydiver choose what parachute to fly? Do they have holes in them? How does the parachute affect how fast I fall? Don’t get us wrong–it’s an enormous subject–but we’ll try to address the basics of these questions in one place. In skydiving, we don’t tend to call our parachutes “parachutes.” Instead, we call them “canopies” or “wings.” In general terms, we have several choices when it comes to canopy shape: rectangular, tapered, elliptical and semi-elliptical. These terms refer to the shape of the canopy when viewed from overhead. The shape of the canopy, as well as its size, greatly affects the flight characteristics of said canopy. In other words: these factors determine how a jumper can expect her canopy to open, fly and land. As a general rule, the amount of taper around the edges of a canopy–the amount of taper that differentiates its shape from a rectangular canopy, that is–increases the aggressiveness of the canopy’s flight characteristics. As a rule, the more taper is introduced, the more performance is expected of and by the pilot, and the less tolerant the canopy is of mistakes in canopy handling. Canopy designs use different amounts of taper–and taper in different places–to dial in the exact level and kind of performance the canopy is meant to deliver. The amount of taper in a canopy’s design most distinctly influences the responsiveness of a canopy. The wing’s aspect ratio and trim angle are key parts of this package, too. The term “elliptical” is often used to describe the canopies that sit at the higher end of the performance envelope. However: No skydiving canopy is truly elliptical. (At least, not yet.) What we see as the “curviness” of a canopy is actually built out of a series of straight-line segments arranged in a generally elliptical shape that don’t form a true ellipse. But that’s, y’know, kinda beside the point. The point is choosing the canopy that works best, not the canopy with the shape name that most appeals to you. 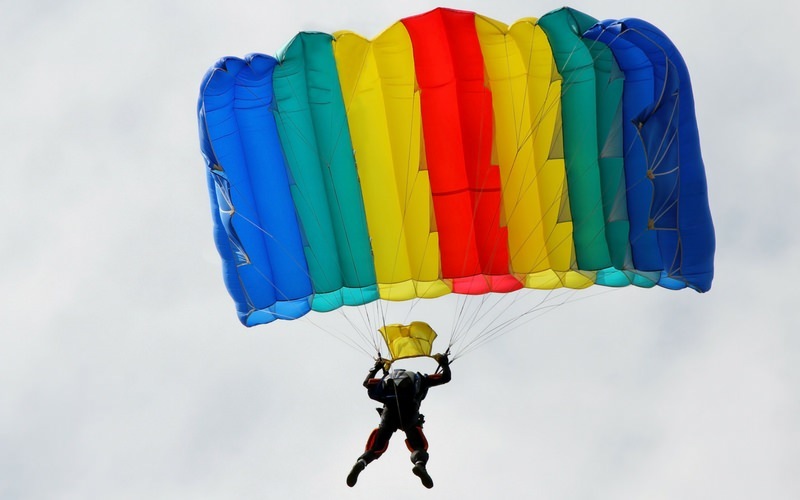 The fabric of a skydiving parachute does have holes–in the front! This is called the “nose” of the canopy. It admits air in order for the canopy to inflate. This is true of every modern, square, steerable parachute (look up “ram-air”–the design type–for more). It’s a canopy’s size–specifically, it’s wing loading (which references the ratio of body weight to canopy size, which is a subject for its very own article)–that determines the canopy’s speed in flight. One might think that there’s a hard-and-fast math to this; that there’s a “magic number” that determines the optimal wing loading for any canopy in the world. There, y’know, isn’t. Manufacturers give their very best recommendations on wing loading charts, but everyone agrees that the best wing loading for each jumper is one that feels safe, comfortable and supportive for his or her particular preferences and conditions. For this reason, we test jump canopies before we buy them–in quite the same way as you test-drive a car. Even if the wing loading is perfect on paper, it just might not feel right. At the end of the day, after all, it’s the feeling right that counts. Tapered, elliptical, rectangular, big, small, swoopy, accurate…none of this stuff makes a canopy “good” or “bad.” Parachutes come in different shapes and sizes, just like people, and great skydivers place just about as much inherent value in parachute shape and size as they do in the shapes and sizes of their friends. The proof of a “good parachute” is how much it makes the jumper smile! Come check out our parachutes at Skydive Monroe!